New Year is most definitely a time for everyone to let their hair down! There a few better places to counting down the New Year under a starry sky in tropical Lombok. As the island’s popularity grows each year, so does the number of inventive ways to celebrate. This is the time when hotels and restaurants across the island lure guests with special packages, kid-friendly events and of course, wild party nights! New Year is most definitely a time for everyone to let their hair down. Lots of young locals head from their villages to the tourist resorts to mingle and party with the crowds. Hotspots such as Senggigi and the Gili Islands lay on a variety of showpiece events, ranging from live music, all night beach parties, and vivid pyrotechnics in the sky. 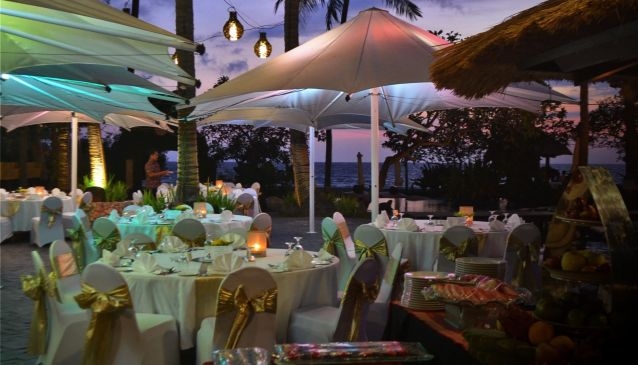 Check out all the great food and party events planned in Lombok this festive season. A sumptuous Gala Dinner on the beach to see in the New Year with a 20% discount offered for all guests wearing white. There is a full programme of vibrant entertainment lined up including live band and DJ, traditional and hip hop dancers, a fire dance and fireworks display to welcome in 2016. Year-end festivities are always epic at Sheraton and this year promises to be just as spectacular. A comprehensive ‘Around the World’ buffet dinner is accompanied by a live band, DJ parade and fire dance and a dazzling fireworks display to see in 2016. There are also door prizes up for grabs for a lucky few. pleasure. There is a highly imaginative menu featuring Atlantic salmon and king prawn and roasted Australian lamb rack, finished off with decadent delights like velvety white chocolate mousse. New Year at Sudamala is set to be a glittering affair with a sumptuous BBQ dinner kicking things off, followed by the Sudamala Talent Show, fire dances and DJ. It promises to be a night to remember. Jeeva Klui’s gala dinner buffet is indeed a tempting spread of fine cuisine and the perfect way to celebrate the end of the year. Diners will embark on an indulgent culinary journey with diverse pan-Asian flavours and hearty western favourites. If you only splurge once a year, make it in Jeeva Klui this NYE. Lotus Bayview presents an Italian themed party night this New Year with fab food and entertainment, including a guest singer and vibrant fireworks to see in 2016. There is a choice of two delicious menus to choose from including traditional Indonesian or a selection of tempting western flavours. Priced at IDR150 000++ pp for Indonesian menu / IDR250 000++pp for Western menu including a glass of wine. Celebrate the start of 2016 in fine style with Square’s 5 Course Gourmet New Year Dinner which includes a free glass of wine for dining reservations made in advance. It’s an inventive menu filled with creative delights fit for the biggest night of the year with baked rock lobster, wagyu beef tenderloin and more. Bon appetite. Be tempted with a fine New Year’s Eve Celebration menu that is sure to get the taste buds tingling. There is a traditional western flavour to the menu, featuring lamb medallions or creamy seafood Alfredo pasta, along with an irresistible choice of desserts to finish. Gili Meno’s big night out begins early from 4pm with sheesha and sundowners to the sounds of a DJ set. A sumptuous New Year’s Eve dinner follows with a menu of premium delights including seafood ravioli, slow roasted black angus beef and tempting desserts. New Year's Eve dinner runs to an epic 7 courses including premium fillet steak or seared salmon at Mahamaya, where the gourmet food experience is perfectly complemented by a vibrant New Year fireworks show, fire dancing and live music. Seri is proudly hosting a New Year Party promising a memorable night of fun and great food. It begins with a comprehensive New Year dinner followed by a party celebration with access to the VIP Lounge. Priced at IDR600,000 per person for dinner and party. A vibrant New Year celebration is planned at Cabalito with a sumptuous dinner and special party with live entertainment to end 2015 on a high. As always Gii T’s Vila Ombak pulls out all the stops for the biggest night of the year. Starting early, there is a full programme of entertainment beginning with a carnival and welcome dance. During the sumptuous gala dinner there are door prizes and live music and ushering in the final hour of 2015, the ‘Gili Glow’ party kicks in with guest international DJ.